At the end of this post I’ll share some links on all 3 elements. Without these basics, you don’t have anything to report on. For the following screenshots I used “Market Research Schedule”. an Office template, available from the “new” section under “File”. I wrote an article about the office templates, you can find it by clicking here. I made some changes to duration and added Will and Dave as resources, both have hourly rates filled in. 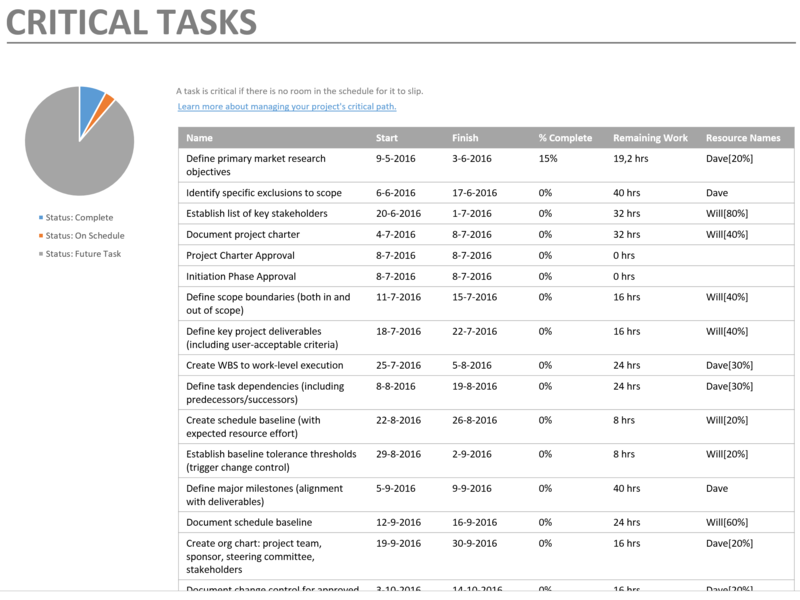 I added assignments, created a baseline and set progress. The Cash flow report is amazing, in it’s simplicity. 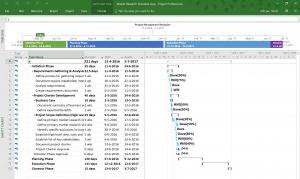 When you create a good WBS in your schedule the table will show you everything cost related to the phases, or if you are a more PMI minded person to all the top deliverables. The table even has the EVM values. There is room for some textual data, you just need to change the text in the right section to reflect the information you want to share with the financial stakeholders. 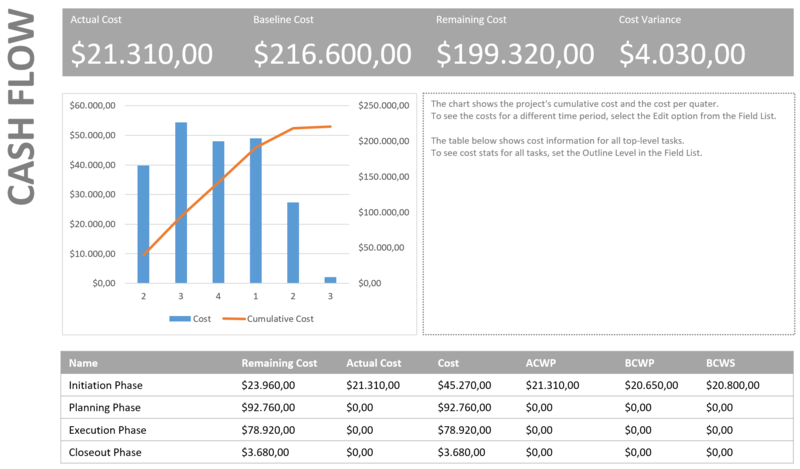 The chart can be changed to show weekly, monthly, quarterly values based on the size of your schedule. And you can add “actuals” to the chart as well. The top section is just pure gold! In 1 bar it shows you the current progress on the whole schedule. Why did I have a cost variance? I changed the rate of Will from 100 dollar to 105 dollar per hour. The Critical Tasks report is charming because it set’s the Critical Path out in a table form. 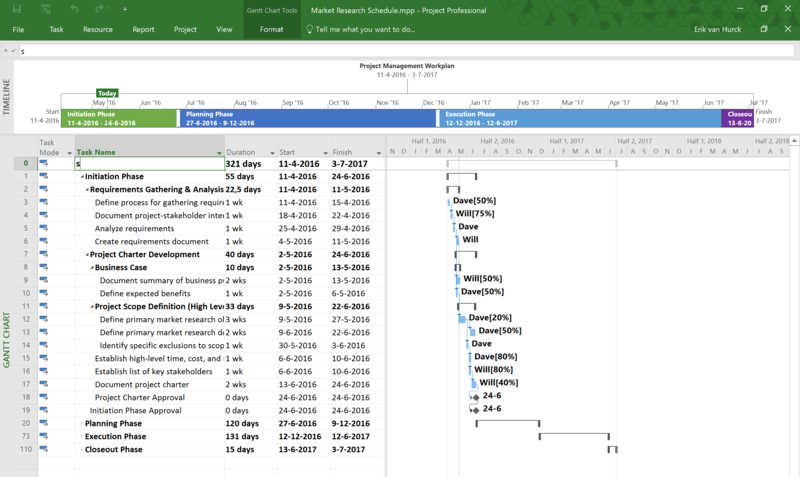 This is charming because you can filter on a time period in your Gantt chart, then move to the report and have all the information on only the critical elements. Now don’t forget the resource critical path that Eric Uyttewaal mentions in his books! That is still something that needs to be added to the product if you ask me. 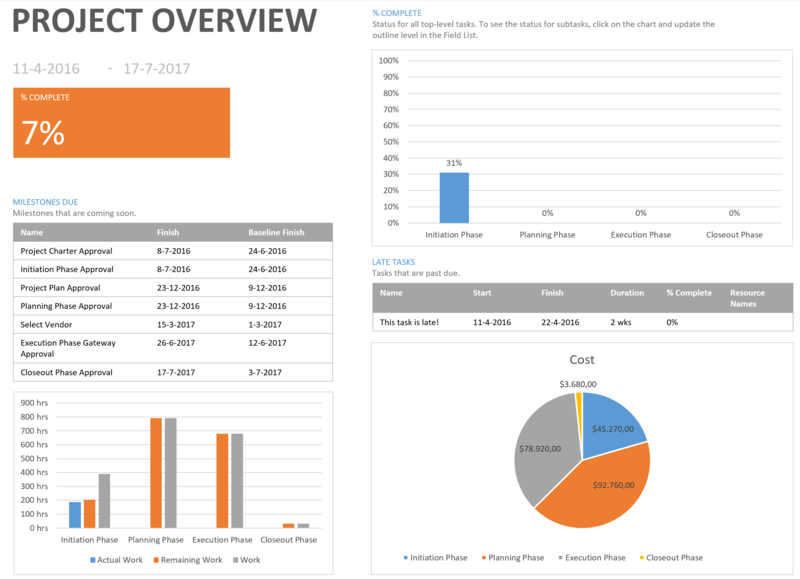 The last report I wanted to share is one that grabs all the project task information and wraps that nice an tight in a little dashboard. That’s it for now, if you like to be informed about new content, please consider subscribing to the newsletter. See you next time!